Since it first appeared on the menu at New York’s trendy Momofuku Nishi back in August, the Impossible Burger has become the city’s most famous patty, drawing in crowds of food critics and meat-lovers alike. With its tender texture, pinkish medium-rare hue and succulent flavour, the sought-after burger seems like the perfect carnivorous feast. Meat, however, is the one ingredient you won’t find in the Impossible Burger. Marketed as a ‘meaty masterpiece’, the pioneering veggie burger is said to be indistinguishable from real beef. 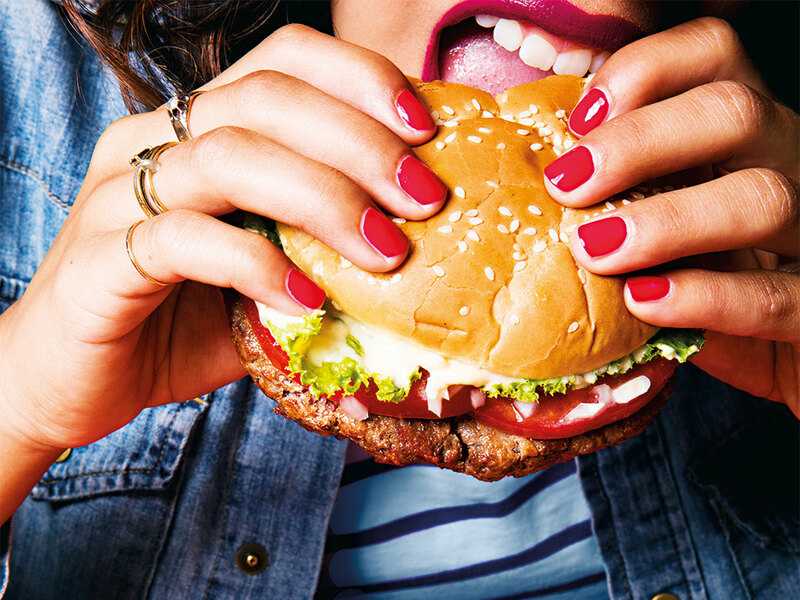 After five years of extensive scientific research into the burger-eating experience, former Stanford University biochemistry professor Patrick Brown and his team at Impossible Foods have finally cracked the perfect plant-based formula. By analysing beef at a molecular level, the Silicon Valley start-up has managed to pinpoint what gives a burger its juicy, meaty flavour: a protein called heme. The runaway success of the Impossible Burger is the latest in a long line of breakthroughs for plant-based protein alternatives. In 2014, the global meat substitutes market was valued at $3.4bn, with big-name investors such as Bill Gates rushing to fund research. Now, as meat replacement creators compete for valuable venture capital, they are united by a common goal: to create a future for food that is better for the planet and better for people. Global meat consumption is growing at an unprecedented rate. In the early 19th century, the average person consumed just 22lbs of meat a year. By 2013, that figure had risen to an incredible 95lbs annually. According to the World Health Organisation (WHO), annual meat production is projected to further swell from 218 million tonnes in 1997-99 to 376 million tonnes by 2030. As this demand for meat continues to grow, so does the environmental toll of global animal agriculture. Raising animals for food uses an unsustainable amount of land and water. Just one kilogram of beef requires 150sq m of land, while a single quarter-pounder hamburger uses the same amount of water as two months of daily showers. Eating into the planet’s resources at an alarming rate, animal agriculture has emerged as the leading cause of deforestation, species extinction, water pollution and ocean dead zones. On top of this, the pollutant gases from meat farming are threatening to push the planet towards an unprecedented environmental catastrophe; animal agriculture is responsible for more greenhouse gas emissions than all the world’s cars, trains, ships and planes combined, with farming emissions projected to rise a further 80 percent by 2050. Clearly, meat farming is making the planet sick, and the same can be said for its people. In 2015, the WHO placed processed meats in the same carcinogenic category as plutonium, while also publishing evidence that links red meat to diagnoses of cancer, heart disease, diabetes and obesity. Despite such troubling health and environmental risks, we can’t expect everyone to become vegetarian. For many, eating meat is not just a part of their daily diet, but also plays an important role in their family and social lives, with meat dishes taking centre stage at celebratory gatherings and religious holidays across the globe. Given the undeniable social significance of meat consumption, future global food habits must focus on a reduction of meat intake. As pioneering meat replacements are slowly convincing carnivores to occasionally opt for a plant-based option, meat-free meals are finally gaining momentum. For meat alternatives to really take off, however, they simply need to be more readily available and affordable. That’s where organisations like ShareAction and FAIRR come in. In an attempt to bring meat replacements to the mass market, these UK-based organisations have collaborated to bring together a $1trn coalition of investors, focused on urging powerful multinational food companies to expand into plant-based products. As part of this initiative, the investor coalition is targeting Kraft Heinz, Nestlé, Unilever and Tesco, among other food producers, advising them of the grave financial and environmental risks tied to animal agriculture. These big-name brands will then be encouraged to establish strategies in order to respond to the risks of meat farming, with investment in plant protein at the top of the list. If consumer health and environmental concerns aren’t motivation enough for food companies to reassess their overreliance on animal agriculture, then the money-saving potential of plant products may do the trick. According to a recent Oxford University study, a global shift away from meat-heavy diets could save the world’s economy $1.5trn in climate change and healthcare costs by 2050. The report revealed a significant dietary change could also save employers tens of billions of dollars in lost working days by reducing meat consumption-related sickness. The project may hope to see plant protein incorporated into the world’s weekly shop, but both ShareAction and FAIRR accept animal products won’t be banished from supermarket shelves anytime soon. “This isn’t about telling people that they can’t have meat; it’s about moderation and moving things in a more sustainable direction”, said Richards. The evidence points to an uncomfortable truth: quite simply, if our diets don’t change, our planet irreversibly will. With new techniques and big-name brands beginning to embrace plant protein, however, meat-free options will soon be more affordable, more widely available, and more delicious than ever. So far, food scientists have only explored around eight percent of the world’s plant proteins as potential meat alternatives, and this limited research has already given us the Impossible Burger – and we’ve not even mentioned the critic-approved Beyond Meat chicken taco and the internationally acclaimed Vegetarian Butcher. As investors turn their attentions to this largely untapped market, plant-based proteins may soon usher in a new sustainable future for food.